So say goodnight to this - the final setting of the sun! F'ero is on the shorter side, and a shade above being thin. He looks rather non-threatening, and very charming despite his age. He has short, yellow-blonde hair, and dark brown-green eyes, though he likes to say that they used to be purple before he got older. Despite his smaller stature, he commonly walks around with his head held high. His clothing choices generally drift between something plain to make himself appear humble, to more showy to proclaim his importance, but overall he cannot be bothered. His words are what charm people, not his clothes. Do not let his charming smile fool you, F'ero is as cunning and cutthroat as they come. He is the first person to steal right from under your nose and then charm you into believing it was someone else. He is manipulative and arrogant, and very, very proud. He holds his head high as he walks, and makes a note to look down at everyone, even if he is looking up at them. Some say he is truly mad inside, and that may not be wrong. There is something wrong with him, but no one would ever know. He keeps his own personal feelings to himself, and is not afraid to lie about something that happened in his past to further manipulate the people around him into listening to him or doing his bidding - all in order to legitimately further his goals to conquer and rule. F'ero’s goals are scattered and widespread. While he perhaps aspires to be a Weyrleader, he would be perfectly content with pulling the strings behind the scenes. If he is in power, he will claim to use it for good, and yet at the same time, he will pretend that everything he does is for the benefit of the weyr - even while murdering someone. He is confident outwardly, and it is not uncommon to see him with dark circles under his eyes and a small twitch. He will claim the dark circles are from trying to come up with new ways to help, but they are always from paranoia and the fear that someone is on to him, that someone knows he is lying, that they have caught him in his words. Fiyero was born to a greenrider father and a bluerider mother at Igen Weyr. With that came no responsibility, no desire, no peals for greatness, not until the other weyrbrats started to harp on him for his smaller stature, and his frail body. Sickly in his youth, Fiyero was not a physical being, but far more a mental one. It was not hard to culture his charm and his silver tongue, and soon enough, the boy who was so frequently picked on was lording over several of the others, with a sharp wit and honeyed words. There was no mistake that he would be a dragonrider one day, and a fine one at that. His superiors would speak of hopes of a bronze, but he set his sights on a less.... threatening goal. He pretended to have no interest in standing, but at the request of his small group of manipulated followers, stood at 15. Pretending to be devastated by the event, he ‘fell’ into a deep depression, manipulating everyone around him to assume he had put everything into the want of a dragon of his own. To supposedly aid him in his ‘grief’, he manipulated osome of the other Candidates around him into waiting on him, to give him what they believed would 'help' him. He was quite good at it, and with clutches still on the way across Pern... he knew that his time was just dawning. Fiyero stood again at 16, and again failed to impress. Now annoyed, he turned his eyes on what the problem was. Surely it was not himself, and it had to be the weyr. Yes, it was the fault of the Queen and her brood. None of them were meant for him, none of them were good enough to produce a dragon that was to be his, to be his own, to be the perfect blend between his manipulation and his ideals and his goals. Not long after he turned 16, and not intending to stand at a hatching in a place where the Queen’s eggs were obviously not meant for him, Fiyero applied for a transfer. Gathering his things, and hopping a ride from a caravan, he uprooted what little life he had and moved right in to Fort Weyr. An absolutely stunning creature. Hellfith is the flame incarnate. She isn't the largest garnet, but she is fast. She has broad wings and a narrow face. 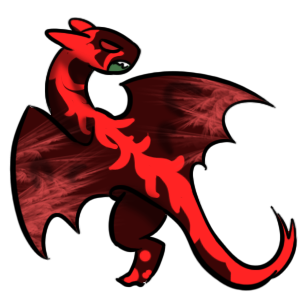 She is a deep ruby red all over, with bright red flame markings over her face and down her back. The same red splashes over her legs, and in wide bands over her hind legs. Her wings have great swaths of a pale red-pink in sharp, streaking motions. She is intimidating, and powerful. If there is a stereotype of "angry garnets" then Hellfith fits. She is a difficult dragon. She is quick to anger and quicker to bite. She is jealous, and it is very hard to connect to her. She will never really get along with most people and dragons, and all trust must be earned. 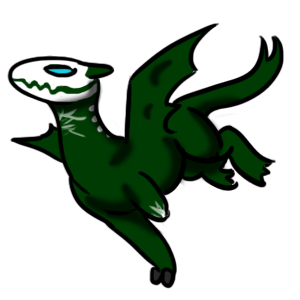 She is a vicious fighter, and while she isn't fit to be a wingleader, she is a fiercely protective dragon and a great partner to have when thread falls. There is almost nothing that can be done to stop her once she's set her mind to a task. To her rider, Hellfith is either extremely stubborn or she is overbearingly protective. Everyone is greeted with suspicion and bitterness, and she will dig her heels in ad refuse to do pretty much anything unless she thinks it's a good idea, and her idea of "good" is never really so easy. There is good in her, but she is a terrible parent and doesn't really work well with others. Voice: Hellfith's voice is sharp and strong, like the roaring flame or a strong, terrible windstorm.